Gutters are essential for routing rain off of roof tops and away from your home. Installed properly, gutters keep basements and crawl spaces dry, preserve topsoil, protect siding from back-splash stain and rot and shield windows and doors from water infiltration and damage. Gutters and downspouts – the complete system – redirect water down to the ground; typically made of aluminum, vinyl, galvanized steel, stainless steel and copper. Wood is also an option, but wood gutters are rare, except for restoration work and in the Pacific Northwest not the most practical material to use. Pricing for the different materials differs greatly; copper is used primary for restorations and beautifying projects. While it never rusts or needs painting, it is typically one of the more expensive materials. Stainless-steel gutters are strong and rust-free, and maintain their high sheen for years; while a high-end material, costs is a factor for most. 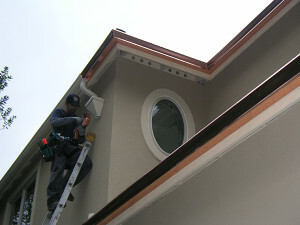 At CR Gutters, Inc. we mainly install galvanized-steel and aluminum gutters for most customers. For special projects we also install seamless coppers. Steel and aluminum gutters are the types most homeowners choose. Steel gutters can stand up to ladders and fallen branches better than aluminum but steel will eventually rusts. Aluminum gutters, however, never rust. Vinyl gutters are typically installed by do-it-yourself types. Them material is easy to cut and in-expensive. However, they do not last as long as other materials as the are prone to becoming brittle and cracking from cold weather. Sizes and shapes. Most gutters come in several sizes and shapes called profiles. These include U shapes as well K configurations, in which the ogee-shaped front looks like the letter K. Gutter channels are available in 4-, 5- or 6-in. diameters; 5-in. Ks are the most common. You’ll also find downspout choices that include 2X3-in. or 3X4-in. rectangular shapes, as well as 3- or 4-in. round pipes. Particularly in leafy areas, use larger downspouts, which minimize clogs. Color. Sectional aluminum and steel gutters come in many different colors – ideal for matching trim and house colors. Gutter colors are baked on at the factory. Click this link to learn more.